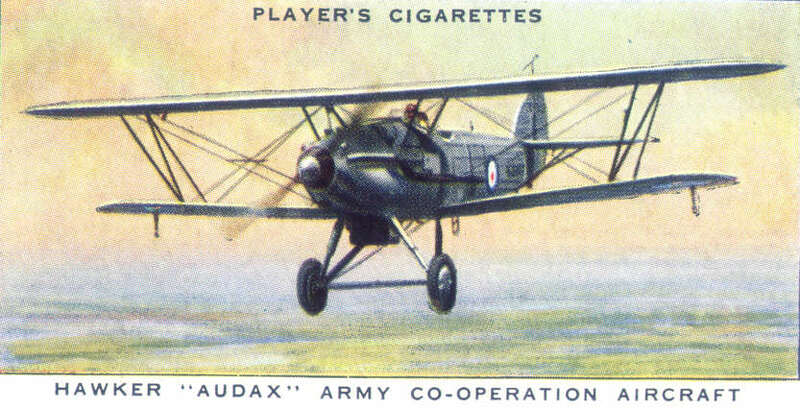 HAWKER "AUDAX" ARMY CO-OPERATION AIRCRAFT. Built by Hawker Aircraft, Ltd., this biplane of all-metal construction is an Army co-operation machine. It is fitted with a Rolls-Royce "Kestrel" engine of 480 h.p. and carries a crew of 2. The maximum speed is 169 m.p.h. It is specially designed and equipped for Army co-operation work, and is fitted with wireless and electrical apparatus and a message pick-up hoop. The dimensions are: wing span 37 feet 3 inches, length 29 feet 7 inches and height 10 feet 7 inches.